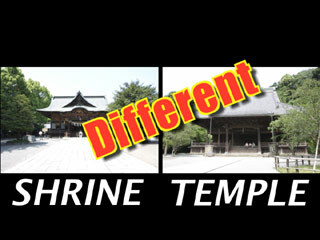 Temple and Shrine are different. Here is how to go and visit to Japanese Shrine. Wash your hands and mouth. Take a water scoop on right hand and scoop water. Wash your left hand first, then wash right hand. Then Then wash your mouth. Don't directly wash your mouth from the scoop. Pour water on your hand then wash. Don't drink OK. This means cleaning your body and mind before you enter Shrine. Don't enter the gate from the center. Center is for only Gods. You should walk the right side of the gate and the pass. Ring the bell and athrow money inton offertory box. The bell call the God of the shrine. Make two deep bowing. Make your wish in your mind. Then make two claps. Then one more deep bowing. That's it. Now you can make any wish at Japanese Shrine.